We are an inclusive bunch of everyday folks—including but not limited to humanists, agnostics, freethinkers, atheists and theists—looking to give back to the community with no strings attached. Regardless of what we do or don’t believe, we all hold humanistic values and choose to give back to the community not because we want to advance a specific cause, not because we are a part of any movement, but because it’s the right thing to do. Simply put, we believe human hands solve human problems. We have two simple goals: give humanists a place they can come help their community with other like-minded individuals, and allow people in need to receive assistance without any preaching or expectation of something in return for what they receive. We truly mean no strings attached. 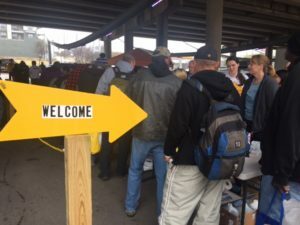 We strive to fulfill those goals through various community projects, the primary one being monthly giveaways, usually on the third Sunday of every month, when we distribute basic living items to people working through homelessness and limited means. We operate drives for special items throughout the year and have started a knitting group to hand-make items for our clients. In preparation for the giveaways, our volunteers collect, sort, and keep the items in their homes until the next event date. Because our group is 100% volunteer-based, the success of our giveaways depends on the community’s generous contributions. Answers to commonly asked questions can be found on our FAQ page. We also have a list of most-needed donations and information about our next giveaway.